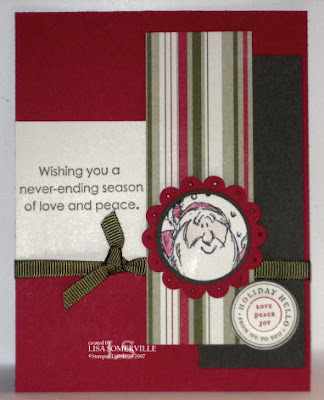 I used the sketch on Lauren's Blog to create this card using Jolliest Time of the Year. When you look at Lauren's sketch, you'll see I altered mine by tying the bow on the left side and adding my additional circle on the right. There he is again--you can't say you didn't get your moneys worth on this little guy! Very cute. I really like him punched out--in a crafting terms that it, lol. Super cute Lisa! Lauren has the best sketches.